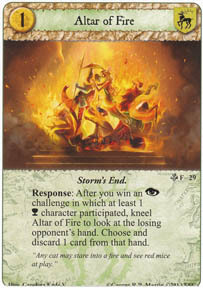 Response: After you win an Intrigue challenge in which at least 1 Holy character participated, kneel Altar of Fire to look at the losing opponent's hand. Choose and discard 1 card from that hand. Flavor Text: "Any cat may stare into a fire and see red mice at play." Quantity: 3 Illustrator: Carolina Eade V.
It is semi-possible to use it with Lannister, but I agree it would be nice for more Holy Lannisters. if you have three can you trigger all three on one int victory? Yes - Is there a reason you thought you cannot? Am I right in thinking you get the claim and an extra card on this when you trigger this?